I don't have any other pictures from this big day. Can you believe these are all ours? Makayla joined our family on December 28th, and it was a perfect few days, aside from the migraine that felled me just before the wedding dinner on the 27th (happened at Heidi's dinner, too. I don't get migraines very often--why on weddings?). We had 80+ people over for Mexican food the night before and housed 15 additional people for a few days before and after the wedding. It was one of the best times ever--late-night games, movies, long talks, and food food food! Makayla's grandfather performed their ceremony, and it was one of the most beautiful I've ever attended. How tender to have your grandpa who's known you every day of your entire life marry you? I felt very privileged to be there that day. Nothing makes me happier than having all of my family together. I love each of their personalities and quirks, and the more we add to the Sanatorium, the better it gets! 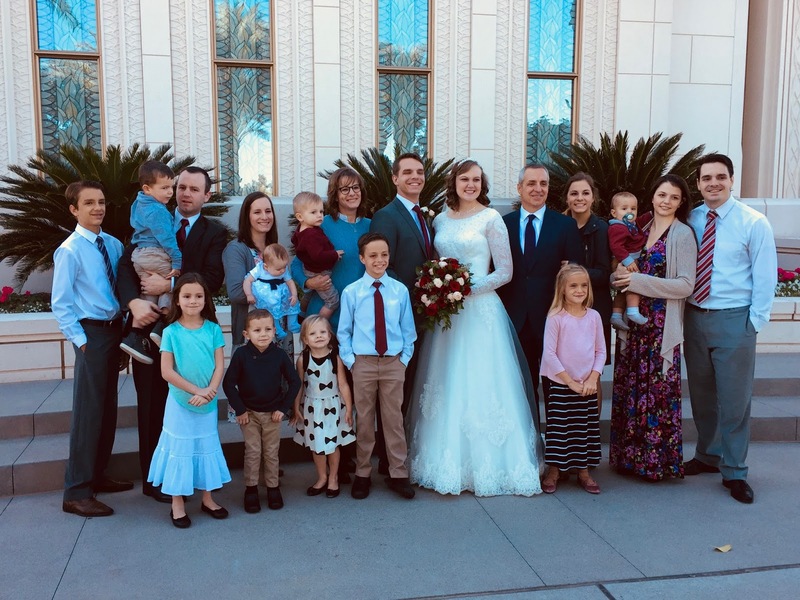 Brad's sister Amy took this picture at the Gilbert temple right after their sealing. I really need to get better at taking pictures with my phone instead of hauling out my big camera. Now that I rarely use the big camera, I have this weird idea that little things aren't worth a crappy phone picture. Another mental block I need to get past--literary and deep blog posts. This is my family record, not a candidate for the Pulitzer. Twoof my goals for 2018--more photos and blog posts. Especially since this photo is already outdated--Karli and Tucker announced they're expecting a new baby in July!